So you're looking for a DMX controller? Good choice. This means you're well aware of how important a good light show can be. The hard part is learning what makes up a good DMX controller. I'm assuming you have already considered DMX software options. If not, this may be the better way to go if you are looking to be mobile. Having it controlled by software means just one less piece of equipment you have to carry around. However, if you're a venue owner, or are thinking of using a permanent setup, spending a little money on a decent DMX controller will go a long way. How complex your controller is (in other words, how expensive) is going to depend on whether you want to have pre-programmed lights, or if you want to have the lights controlled live. If you haven't settled on DJ lights, here is an entire article dedicated to that subject. The Charuvet DJ Obey 3 is one of the best-selling DMX controllers on the market. It's simple, yet highly functional. It also happens to offer the lowest price-point. You have the option to run automated, sound-activated or manual RGB. You cannot pre-program your light shows so if you are looking for something that is hands off you'll want to move down the list. The DMX-Operator by ADJ is my favorite controller on the list. This controller provides you with incredible value at an entry-level price point. You are able to control up to 12 different light fixtures - plenty of space for almost every mobile DJ setup. This means you have the potential to control up to 192 DMX channels in total . You can record up to 6 pre-programmed chases with different fade times and speeds. Additionally, the controller will also act as a MIDI controller. I don't really see this being a helpful feature, but it's there. This controller is the best example of something simple that can handle complex light shows. It's simple to use yet incredibly powerful. One critique is the lack of control wheels. This makes it difficult to manually control the pan and tilt of your lights. If you are wanting these features check out the 384 below. 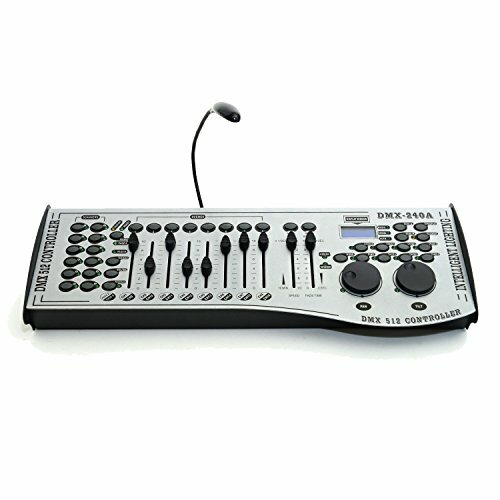 If you are not completely sold on the Operator, the DMX 512 is another great option. One stand-out feature is the built-in microphone. This is an easy way to trigger the lights through clapping or vocals. Similar to the Operator above, this controller lets you control 192 channels in total. You can also pre-program 240 scenes with 6 sets of different chases. Another stand-out feature is the set of control wheels. This is a crucial feature if you want to manually control the pan and tilt of your lights. Something the Operator definitely lacks. Again, this is something that is simple to use but can handle plenty of complexity. Check it out in action below. The Operator-384 is nearly identical to the Operator above. It just has a few more features that make it much more useful for anyone looking to have complete control of their lights. The first difference that stands out is the additional DMX channels. You are getting an extra set of channels when you consider 32 channels for each fixture. This brings the count up to 384 in total. Additionally, you are getting the control toggle that you can use to adjust the pitch and pan of your lights. 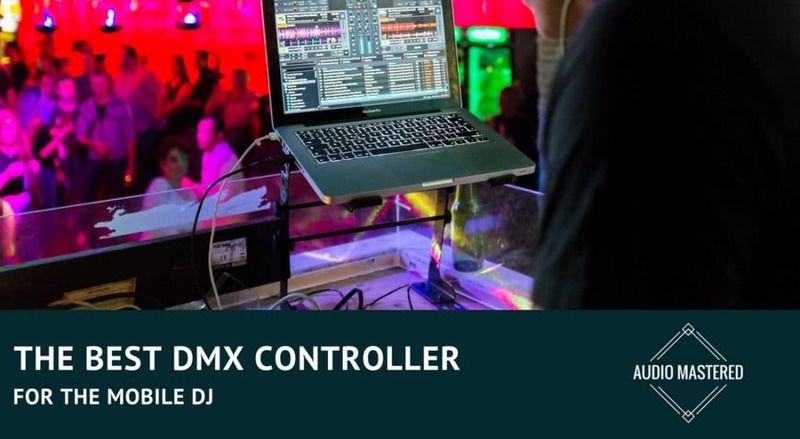 Considering all of these features, it's no surprise the 384 is one of the most well regarded DMX controllers on the market. You can see it working below. Finally, the last controller on my list, the Chauvet DJ OBEY70. If you look at the specs you'll see the Obey70 is very similar to the Operator-384. You get the same amount of DMX channels (384) and the same amount of scenes (240.) You also get the pitch and pan control and the ability to pre-program any light show you can come up with. One small difference is this controller comes with 4 DMX cables. Not a huge deal, but it should be factored into your price considerations. This controller can get as complex as you need it to. I don't expect many DJs will run into any walls or limitations. The only difficult thing will be learning how to program your DMX lights in the first place. It's not always as simple as the more expensive the better. This is especially true with DMX controllers. You'll need to balance the complexity of the controller with your needs. 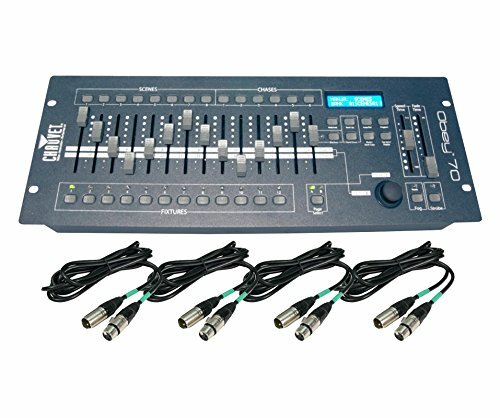 If you are using a minimal light setup there isn't really a need for an 8 channel controller. You would be far better or with a simpler 3-channel. 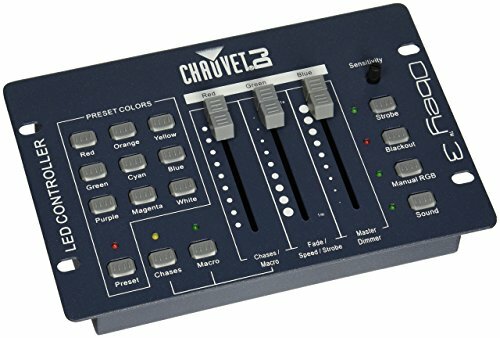 However, if you are planning on having a more complicated setup, or if you would like to interface with other FX likes fog or a strobe, then you'll want to look at a more complex controller. You also need to decide if you'll be needing to control the pan and pitch of each individual light. If so, you need a controller with a stick or some other kind of control. You have three options when it comes to light connections. DMX specific cables are the most common method of connecting your lights. They typically will be connected by what's called daisy-chaining. Basically, you just connect one light to the other until you hit your controller. There are also ways to connect your lights to your controller without using any cables whatsoever. It's called wireless DMX and is becoming increasingly popular. This is my recommendation if you'd like to go that route. If you're not into spending an extra $100 on connection cables you can always use some spare XLR cables. This is usually the cheaper way to go but keep in mind you may be sacrificing some transmission quality. 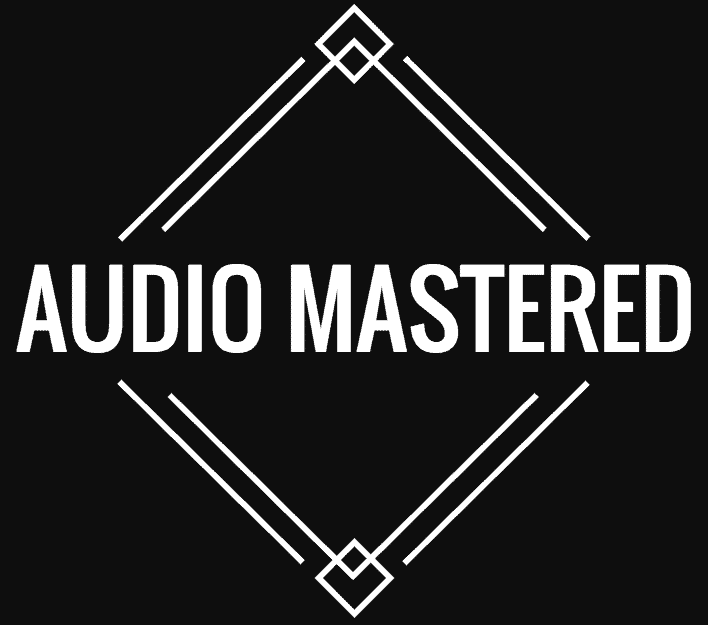 Here's a complete rundown on XLR cables if you're interested. Programming your lights can get pretty complicated. Most live shows use a combination of pre-programmed sequences with cue points during the song. Getting your head around the basics can seem complicated at first. Once you wrap your head around the vocabulary things will start to make more sense. As a quick overview - each fixture is going to need to be assigned an address. From their, it is going to need to be assigned to a channel where you will control the effect. If you want multiple effects for a single fixture you will need to assign that fixture to two different channels. Assigning two different lights to a single channel will allow the lights to 'sync' up with each other and be controlled in unison. Most of the controllers will come pre-loaded with a few sequences you can use right out of the box. It's not as complicated as it sounds! If you don't have any moving lights, be sure to check out a few of my favorites here! I hope this has helped! Until next time.